$55.97 This item is selling for $55.97 on eBay. 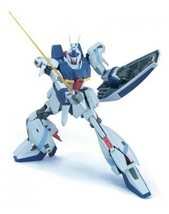 Description Label: Bandai Brand: Bandai ReleaseDate: 2006-08-11 Bandai Refine · Gundam · Zeta = "Ri · Gazi" lineup to Hi-CONPO. It is reproducing the deformation to the space fighter form which unites the back main weapon system which is the characteristic of "Ri Gazi" and the MS main body. Head part Camera eye etc. Sensor part expresses with clear parts. Weapons come with beam rifle, beam saber, shield. A set of exclusive stands decorated with space fighter and back weapon system Payment We only accept PayPal payments. Please pay within 5 days after auction is finished. Shipping Shipping Cost Shipping Method Asia North America Central America Middle EastAU, NZ Europe Russia South America Africa Non-Registered Small Parcel SAL Free Free Free USD 9 Shipping Duration Shipping Method Asia North America Central America Middle East AU, NZ Europe Russia South America Africa Non-Registerd Small Parcel SAL 2 - 3 weeks 2 - 4 weeks 2 - 5 weeks 3 - 7 weeks As for that in which the prices of goods exceed 100 USD, I attach a tracking number. [To buyers from South America, Russia and Africa:] Your country is very far from Japan and it takes long till the item reaches you. From my experience it could take 3 to 7 weeks. Therefore I highly recommend that you add tracking number. That way you can track your parcel and there is no need to worry about parcel not arriving for a long time. The fee to attach a tracking number is only 4. If you understand this fact and wish to attach a tracking number, please contact me. I will send you an additional invoice . Terms of Sale Money back guarantee within 60 days if returned by customer. Return Policy - Damage or Unsatisfied: Please email me if there are any problems with a product. I want my customer to be 100% satisfied with the product. You have 60 days within receipt of the product to return it for a refund. If you receive incorrect item (which is not the item as described), we will make full refund including the return postage from your country to Japan. However, the refund will not include shipping normally. - Lost or Never Received Purchase: Please contact us if you didn't receive a purchase. We will track your package again with Japan Post Service. If we cannot find them after the investigation, we will issue you a refund. About Us Our Products are 100% Authentic. If you have any questions, please contact me any time. Happy Bidding!! International Buyers - Please Note: Yes, we will ship to international buyers. International Buyers?? Please Note: Import duties, taxes and charges are not included in the item price or shipping charges. These charges are the buyer's responsibility. Please check with your country's customs office to determine what these additional costs will be prior to bidding/buying. These charges are normally collected by the delivering freight (shipping) company or when you pick the item up -?do not confuse them for additional shipping charges. We do not mark merchandise values below value or mark items as "gifts" - US and International government regulations prohibit such behavior. Note* This product is available in Japan. Almost products have Japanese in its instructions or contents. Please understand that for your shopping. Also, when you buy Japanese electric products from us, please make sure about Japanese electronic equipment. The voltage and the plug vary across countries. You may need the electric transformer and the conversion plug to use that kind of the products.